Arbor was set up on the beach south. It is the look of natural wood with two nice sprays on each side. 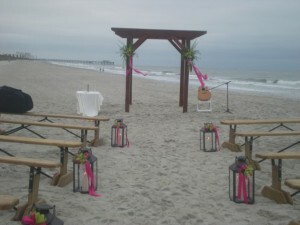 The benches can be rented to further create the natural look on the beach. The tall lanterns were placed at every other bench with a similar small accent of flowers fixed to the handle.